Looking for a different drill to use at the beginning of your training sessions? Here is a simple dribbling and passing drill that is easily adaptable and can involve many players at once. The clip below is courtesy of World Class Coaching, a great resource for coaches. In the video Coach Tom Mura illustrates a warm-up drill that he calls Double Box. This is a simple, easy to teach drill that can be altered to meet your team’s needs. To start the drill use cones to mark a large square with the cones placed 20 yards apart. In the center of the large square, mark a second square with cones that are placed five yards apart. Position a line of players (3 to 4 players) at each corner of the large square. To begin the drill Coach Mura has his players simply dribble into the cone and the return to their line. He then progresses to dribbling into the cone, making a move and then dribbling to the line to their right. Next, he asks them to make a move and then dribble to the left. This is a point in the drill where you can add some variety. You may either let the players be creative with their moves are you might want to dictate the moves they make. In the next progression of the drill, players are asked to dribble straight through the box to the line opposite them. This requires them to negotiate traffic in the center box. He then askes them to dribble into the box and then make a move and dribble either to the left or right. Not shown in this video, however, the next progression would include adding a player at the corners of the small box and introducing a pass to the drill. The combinations here are limited only by your imagination. Add moves, return passes or whatever you want to complete this versatile warm-up drill. 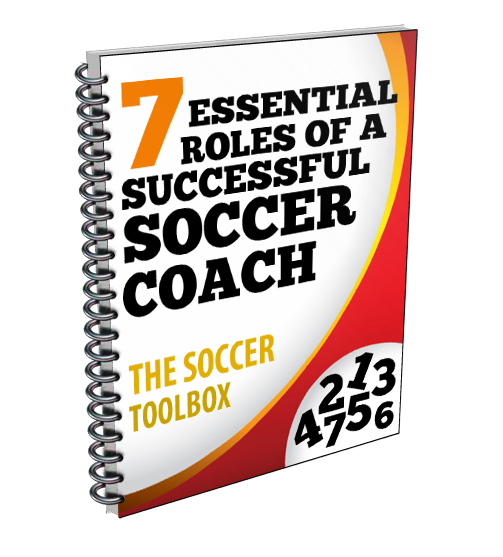 World Class Coaching offers a wide variety of resources for coaches, but I just want to point out a free resource for you. Click this link 50 Free Coaching Drills and receive a free coaching eBook. 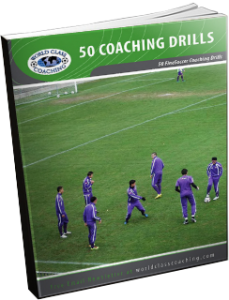 Here is the link to the World Class Coaching Free eBook that includes 50 drills.